Matthias Löb Director of the Regional Association of Westphalia-Lippe. Welcome to the Internet pages of LWL! Our slogan is "Let’s do something good!" Obtain information about the structure of the LWL and its varied services for the people and local authorities of the Westphalia-Lippe region. I hope that you will enjoy our presentation! 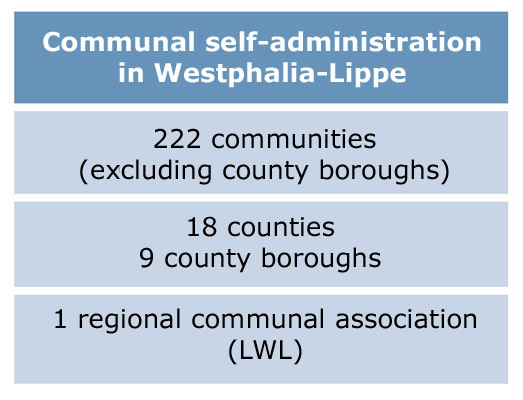 The Westphalia-Lippe Regional Association (LWL) is a municipal association with more than 17,000 employees, who serve the 8.3 million inhabitants of this region. The LWL operates 35 special schools, 21 hospitals, 18 museums, as well as two visitor centres, and is one of the largest German providers of financial assistance to people with disabilities. It thus fulfils various responsibilities in the social sphere, provides support for young people, people with disabilities and psychiatric patients, and plays a cultural role throughout the federal state of Westphalia. The LWL is also committed to creating an inclusive society in all spheres of life. 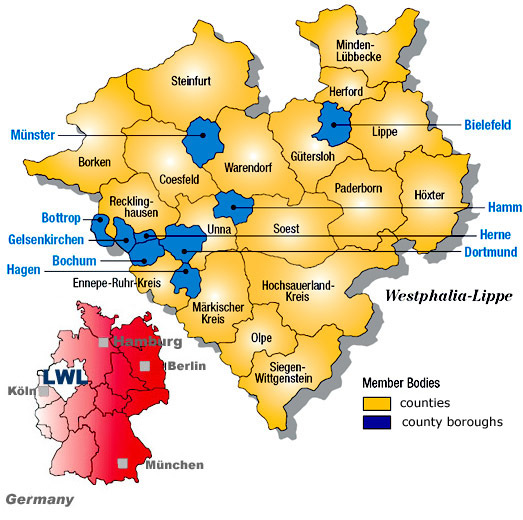 The nine independent cities and 18 districts of Westphalia-Lippe are all members of the LWL. They sustain and finance the Regional Association, the duties of which include operating a parliament consisting of 116 members from the Westphalian municipalities. Disabled persons should be able to shape their lives independently as far as this is possible. Facilitating this in Westphalia-Lippe is one of the main goals of the LWL-Disabled Care in Westphalia. The LWL covers the costs of care and support for 69.000 care cases, currently spending 2.2 billion Euro per annum. As disabled care is developing, the focus is shifting from in-patient accommodation and care to out-patient residence. Currently, approximately 29.000 disabled people live in Westphalia-Lippe in out-patient care structures in their own home. Offers for independent living are continuously being extended in cooperation with the organisation "Freie Wohlfartspflege" (Independent Welfare Care). The LWL also provides services for approximately 25.000 blind, severely visually impaired and deaf persons, spending approximately 82.5 million Euro per year for this purpose. The LWL-Integration Office Westphalia supports severely disabled employees in all issues concerning their workplace. It is a self-help organisation for approximately 95.000 severely disabled persons and approximately 25.000 companies in Westphalia-Lippe. The Integration Office advises severely disabled persons and their employers in connection with the installation and restructuring of workplaces that are suitable for disabled persons and finances a large part of the costs involved. It provides disabled employees with "continued support" that helps them retain their workplace (e.g. in-house work training at the workplace). There are five specialist services that can be involved in the event of problems at the workplace - specialist services for visually and auditory disabled persons, for the prevention of addiction, the psycho-social and the engineering specialist service. Within the field of war victim support, the LWL supports approximately 31.500 war victims and their surviving dependants, who mainly receive support for care requirements. Similar services are available for approximately 4.400 other persons (e.g. victims of acts of violence or side-effects of vaccinations). Since January 2008, the LWL-Pension Office Westphalia has taken over the tasks related to welfare compensation rights from the previously responsible pension offices in Münster, Soest, Dortmund, Bielefeld and Gelsenkirchen and has centralised them in Münster. Persons who have suffered damage to their health can receive state services if specific conditions are fulfilled. These services are intended to compensate the persons concerned for the damage to their health. They are referred to as "welfare compensation", as the general public pays for the damage to the individual. • support of surviving dependants, i.e. widows, widowers, partners, orphans and parents. Various pensions and services ensure appropriate economic support. The LWL-Psychiatry Association Westphalia offers a range of services for the treatment, rehabilitation, re-integration and care of mentally ill or mentally disabled persons. It is a health care provider with approximately 6.800 beds and care places and is one of the main pillars of psychiatric support for the 8.3 million people of Westphalia-Lippe. The tight integration of all offers, institutions and services of the LWL ensures a high level of support for the people in this region. The LWL-Psychiatry Association Westphalia has more than 130 facilities and branch offices and covers the whole of Westphalia-Lippe: eleven clinics for adult psychiatry and four clinics for child and youth psychiatry provide the hospital services. They are associated with 37 acute day wards and 38 outpatient care centres. More than 57.000 persons per year use the (partially) in-patient care services of the clinics. In addition, many persons are treated as out-patients. The LWL-Psychiatry Association Westphalia has five centres for the medical rehabilitation of addicted persons and two institutes for the rehabilitation of mentally ill persons. Mentally disabled persons and those with multiple disabilities are provided with special care and support in ten independent living centres, seven care centres, two day-care centres and one workshop for disabled persons. The service spectrum is characterised by differentiated and specialised offers that are provided close to the place of residence. The LWL provides government services related to hospital treatment orders within Westphalia-Lippe: the treatment and accommodation of mentally ill and addicted persons that have committed a crime due to their illness. The goal of the therapy is to enable the patients to live a crime-free life and, if possible, to live a largely independent live within society. Qualified treatment and care of forensic patients is provided by appropriate specialist staff using special constructive and electronic safety measures. Currently, the LWL maintains six hospital treatment order clinics with approximately 1.200 patients in Lippstadt-Eickelborn, Herne, Marsberg, Rheine, Stemwede-Haldem and Dortmund. Approximately 6.000 children and adolescents in Westphalia-Lippe attend one of the 35 LWL-special schools or one of the three schools for sick persons operated by the LWL. The LWL ensures that all pupils are supported as well as possible. Most of the LWL-schools teach on the level of primary and secondary school. Pupils with additional mental handicaps or learning disabilities can be guided towards special school- leaving certificates. Some support centres offer higher secondary education. Additional school and vocational certificates are offered for young blind or visually impaired persons by a vocational college and vocational training centre. Some support areas offer care and accommodation in a boarding school. · Financial support of facilities and projects in youth support, in particular support of disabled children in day-care facilities. In addition, the LWL-State Youth Welfare Office maintains its own facilities, i.e. three child and youth children`s homes, the LWL-educational centre “Jugendhof Vlotho” as well as a professional college for specialists in youth care and disabled care. The LWL-Coordination Office for drug related issues informs and advises carriers and employees of the approximately 730 institutions and initiatives for aid to addicted persons in Westphalia-Lippe. It organises specialist congresses as well as professional education options and explores new ways of helping addicted persons and preventing addiction. The LWL-Cultural Services research, collect and maintain artefacts documenting the history of Westphalia. They also support current art to build a bridge between the past and the presence. LWL has established a far-reaching cultural network consisting of museums, offices, scientific commissions and an institute to make the culture of the region accessible to the people living there, as well as to all interested visitors and researchers from other parts of the world. The result of this work is an attractive offer for all people interested in culture and history, providing a wide range of services and events. "In der Kaiserpfalz" Museum, Paderborn, "From the time of the Carolingians to the 17th century"
LWL-Industry Museum - with eight sites that give a vivid impression of industrial development from coal mining to glass production. The culture calendar at http://www.lwl.org/LWL/Kultur/Kulturabteilung/Kulturkalender/ provides you with information on the latest exhibitions and events. The LWL-Cultural Services provide assistance, consulting and support to the regions, cities and municipalities, but also to interested individuals in Westphalia. This concerns the preservation of historical monuments, archaeology, landscape and buildings, as well as archive maintenance. The Museum Office also provides help with queries concerning collections and exhibitions. The LWL-Media Centre Westphalia offers varied collection of images, films and sound documents. Within the framework of Westphalian national history research, six scientific commissions closely cooperate with the universities. They perform research in the fields of archaeology, ethnology, geographical national history, dialect and names as well as literature. The LWL-Institute for Westphalian Regional History pursues regional historical research up to the 19th and 20th century. The LWL is involved in the current cultural scene by awarding prices in painting, music and literature as well as the support of Westphalian national history research. It initiates own exhibitions and supports various promising activities concerning regional cultural work, for example in the fields of music, theatre, fine arts and the cultivation of local traditions. The 9 county boroughs and 18 counties in Westphalia-Lippe are members of the LWL. They support and finance the LWL, which provides services to the people of Westphalia-Lippe on request. Special tasks for which the financial capacity at local and county level is not sufficient, e.g. special schools for disabled children, psychiatric support and care places. Tasks that have a Westphalia-wide context due to their nature. These include a wide range of cultural tasks that relate to the historical cultural region of Westphalia. On average, approximately 230 young people with cognitive impairments or physical disabilities live in each of the county boroughs or counties in Westphalia-Lippe. However, it is not viable to provide separate special schools for children with visual, auditory, speech or physical impairments at a local level. The LWL therefore maintains 35 special schools at various sites in Westphalia-Lippe. The LWL-Open Air Museum Hagen is aimed at making the history of trade and technology in Westphalia accessible to the public. Visitors from all parts of Westphalia can attend numerous workshops to familiarise themselves with the historical working methods of various trades and to understand the development of trade and technology. In Westphalia-Lippe, the Westphalian part of North-Rhine-Westphalia, the LWL acts as a municipal service provider for the resident 8.3 million people. The 9 county boroughs and 18 counties in Westphalia are members of the LWL. The policy of the LWL is determined by a political committee - the Regional Association Assembly. The members of this committee are elected by the citizens during the municipal elections. Counties and county boroughs send deputies of their representatives or administrations to the Regional Association Assembly. The composition of the Regional Association Assembly reflects the current strength of the political parties in the area of the association. The members of the Regional Association Assembly make decisions concerning the basic policy of the association and the budget and elect the director and the county administrators of the LWL. The total LWL-budget for 2018 is approximately 3.55 billion Euro. Approximately 90 percent are spent on welfare services, particular in the field of the integration of disabled persons. The LWL budget is mainly financed by the regional association contributions of the member organisations, i.e. the counties and county boroughs, which currently amount to 2.22 billion Euro. A smaller part is covered by general-purpose financing of the state of North-Rhine-Westphalia. Most of the 17.000 employees (approximately 90 percent) work locally in clinics, independent living centres and care centres, special schools, museums and cultural offices. The variety of responsibilities reflects the various professional groups of the employees. Most of them work in the fields of welfare and health (special medical doctors, nurses and care workers, staff in the fields of psychology, educational science, social work, occupational therapy and physiotherapy). The employees of the cultural services are a comparatively small group and most of them provide specialised services. In order to handle its tasks, the LWL maintains approximately 200 facilities and branch offices in Westphalia-Lippe. They are located in a total of 53 municipalities. One of the concerns of the LWL is to create living conditions of equal value in Westphalia-Lippe and to contribute to the improvement of the economic structure. It is therefore participating in financial services providers (Provinzial NordWest-Gruppe) or supply companies (RWE AG). The management of the pension funds of Westphalia is also part of the municipal economy. These funds provide benefits (pensions, corporate old-age benefits) for the employees of municipal employers.